HHO/Oxyhydrogen water torch is capable of producing a 5,075 F flame! It has a built in control valve to adjust flame size. Attaches directly to any HHO cell and has a 1/4 ID NPT brass fitting attachment. Couplers are readily available from Lowes or Home Depot if your HHO cell uses a different size hose. The unit is hand built from red brass alloy, alloy 101 copper and aircraft grade aluminum. Each unit may have small unique variances due to the fact that they are hand made. 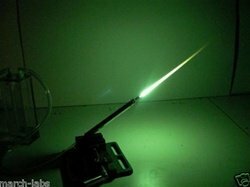 Pure hydrogen-oxygen flames burn in the ultraviolet color range and are nearly invisible to the naked eye. Special compounds that are readily available can be added to the bubbler water to produce colored flames. RED GREEN BLUE PINK and ORANGE. Formulas are provided with purchase of the torch. Can be used as a jewelers torch, glass work , as a small welding torch for any metal, a cutting torch to make your own stainless electrodes. Great for people with 4X4's for on the trail repairs! It also works well for welding/brazing aluminum as it does not produce a lot of oxidation on the weld seam. It burns hot enough to actually ignite aluminum as shown in the video. Tears through stainless steel razor blades! you could even use it as a heat source! We recommend using a hydrogen generator with a minimum of 1 LPM output. Works best with our DRY cell unit and sealed circulatory system. 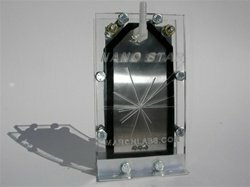 The optional Nanostar is shown below and can be used to operate the laser torch. The unit is a 9 plate drycell - series cell using our high molybdenum super alloy electrodes. OUTPUT is 1-2 LPM!We use 316 bolts and brass nuts for our electrical lugs.Superior quality to anything else on the market! HHONAR has not yet tested this product at this time.